While we are busy preparing for next week’s Irish Evening with Emma Donoghue — do you have your tickets? — we want to take a moment and recommend an event that is quite a favorite, the Super Bowl Sunday reading in Frederick, Maryland. This year, the wonderful Kay Ryan is to read at the free event. 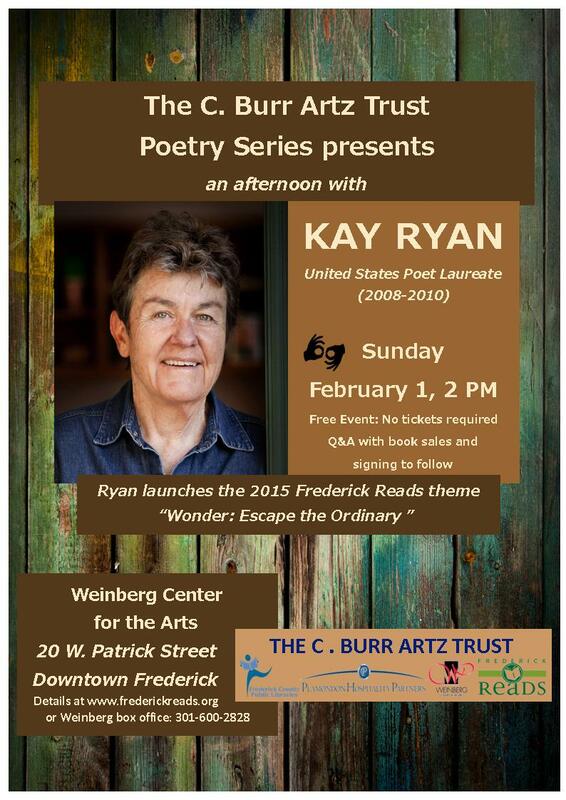 Ryan will be in Frederick on Sunday [February 1st] as part of the C. Burr Artz Poetry/Lecture Series, kicking off the 2015 Frederick Reads season, the theme of which is Season of Wonder: Escape the Ordinary. Past poets in the annual event, traditionally held at the Weinberg Center on Super Bowl Sunday, have included Billy Collins, Nikki Giovanni and Natasha Tretheway, among others. A reading of her work will be followed by a Q&A session with the audience. We will admit there are a number of best parts to this event. One is, obviously, the magnificent Kay Ryan. Two, for us, is that it is an event we are not producing, thus can sit back and selfishly enjoy the occasion, all ears and not a care in the world. The third is that, for those of us that fancy football, it gets not in the way at all of Super Bowl Festivities, though we admit that E. Ethelbert Miller was a little startled that we would do anything but put on jerseys and pregame with chips, guacamole and salsa and banter prior to Sunday evening’s sporting occasion. Don’t worry, the folks at Frederick Reads will have you back in time for all of that. The reading is perfectly placed into the day at 2 p.m.
We hope to see you there and we hope to see you the following Friday for our wonderful evening of Irish writing, music, and dance. By hocopolitso in HoCoPoLitSo Reccomends on January 29, 2015 .